Learn the basics of how to dance with a partner with easy to learn videos below. The following 3 basic Ballroom dance steps are a perfect way to get started with social Ballroom dancing. We have included the basic dance moves for 3 popular dances: Rumba, Swing and Waltz. 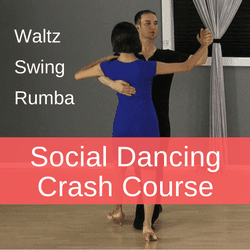 These lessons come directly from the Social dancing crash course where couples can learn how to dance at any social event including weddings and parties. Be sure to try out the moves with us right away from home, the men can follow Leon, and the women can follow Kim. Be sure to watch the videos to the very end where we included a practice session with us counting you in - that is the most helpful part! Learn how to dance with a partner the Waltz. It is one of the most popular Ballroom dances and has a very elegant movement to it. This basic dance step is also a "box step" just like you will learn in Rumba below, but please note it is counted differently than than the Rumba. Here the count is 1,2,3 instead of S,Q,Q. Enjoy! Learn the basic steps of 3 popular Ballroom dances: Waltz, Swing and Rumba. 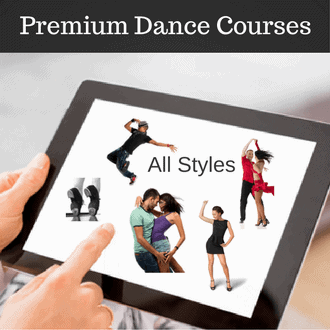 Get the confidence you need to dance with your partner at weddings, parties and social events. Learn individual moves and combinations with ease. Watch it online on any device. In this video you will learn the basic dance step of the East Coast Swing! The Swing dance is perfect to dance to the faster more energetic type of music (Like good old 'rock no roll'). The basic moves of this dance consists of the rock step and triple step, triple step. Men start the rock step with left foot and the ladies with right foot. So go ahead get ready to practice it with us from home. The Rumba is the perfect partner dance for couples as it uses 4/4 music structure which means it fits most of the songs out there. You will learn the "box step" which is exactly the way it sounds, just imagine you have a box in front of you and step on the corners of the box. The men start the box with the left foot forward, while the ladies start with right foot back. Have fun with it and when you get it, check out Video # 2 below.